Florida's Division of Emergency Management (FDEM) undertook a huge effort to design, conduct and evaluate a statewide interoperable communications exercise entitled "Operation RADAR II," which was held February 4-8, 2013. During the multi-day exercise, teams from numerous disciplines from state, county and city agencies rolled mobile communications units to, and worked from, the National Guard's Camp Blanding in northeast Florida. The plan was to establish communications networks and pass messages testing connectivity among one another and with county EOCs and Public Safety Access Points (PSAPs) located throughout the disaster-prone state. The goal was to fully integrate multiple communications systems into an effective emergency communications network. Objectives included the identification of shortfalls in resources, limits in capabilities, and conflicts in planning for interoperable communications; demonstration of the ability to communicate throughout the emergency response community and establish interoperable voice and data communications between federal, state, and local first responders; evaluation of response partners' ability to share necessary, appropriate data in all environments; and the demonstration that all response partners can effectively share information between communication modes. transportation concerns, and widespread communications breakdowns and failures. Regions 3, 4, and 5 were hardest hit and needed interoperable communications support from the other four regions, state and federal resources. The budget for the exercise was $400,000, according to Bob Little, KK4OAI, FDEM's Communications Grant Manager. ARES played a major role in this exercise for the first time, thanks in large part to the efforts of dynamic Northern Florida Section Manager Paul Eakin, KJ4G, and ardent supporters of Amateur Radio on the staff of the mega state EOC at Tallahassee. FDEM's Amateur Radio Unit, managed by Eakin, served as the Command Post/Auxiliary State Warning Point and as the hub for message and request routing and tracking via the state's Internet-based Constellation system. Kimo Montague, K4IMO, a veteran state emergency communications tech, ran this function from a position within the Amateur Radio tent. The interoperability aspect provided by Amateur Radio was manifested by radio amateurs deployed with the various other teams and mobile units situated at distant locations throughout the large military campus, and around the state. Estimates of 50% to 75% of the field teams/units had active radio amateurs handling traffic with the CP/ASWP Amateur Radio tent. For example, a message originated at a county emergency management unit could be sent by one of the agency's radio amateurs to the CP/ASWP tent via any one of several frequencies and modes, and then a radio amateur there would process it, log it, and send it to its destination unit via the appropriate frequency and mode. Thus, the message crosses jurisdictional and functional lines in a flash: Interoperability achieved, routing via Amateur Radio. The exercise was run under the NIMS Incident Command System, with COMLs in charge of the Communications Units, and with all ICS log, message, and other forms used. Several radio amateurs participated as newly minted certified Auxiliary Communications (AUXCOMM) operators, including Jeff Capehart, W4UFL, Alachua county's EC and RACES Radio Officer, who brought a mobile crank-up tower and station. (The Auxiliary Communications course has been developed and implemented by the Department of Homeland Security's Office of Emergency Communications, for radio amateurs; one course has been given in Florida so far). If any player needed to communicate with the State Warning Point, they were directed to contact the Amateur Radio unit, serving as the command post and auxiliary State Warning Point. FDEM communications officers were in the Amateur Radio tent for this purpose. Other inter-agency and/or inter-function messages were handled in the same way. The primary communications platforms were two HF stations on voice LSB, one on 3950 kHz and the other on 7242 kHz; and an array of two-meter FM simplex frequencies for direct, point-to-point locale coverage. NVIS dipoles were deployed for the HF stations. The goal was communications redundancy, so several back-up bands and modes were tested as well. 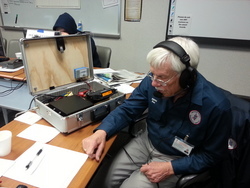 A portable UHF FM repeater (KJ4G) provided intra-site tactical communications for Amateur Radio Unit team members. Five different 2-meter FM simplex frequencies were available for inter-site communications, all with the call sign KA4EOC, the state EOC's station call sign. On the digital mode side of the operations, several positions in the tent were dedicated to different systems, including the Southeastern Emergency Digital Associations Network (SEDAN), an extensive net on 145.77 MHz of traditional packet radio nodes heavily invested in Florida. An Automatic Packet Reporting System (APRS) node (N2DB) was active on 144.39 MHz, tracking the movement and locations of most of the players on the exercise field. A separate tent housed two Winlink (a global radio e-mail system) stations, one on a VHF (145.63 MHz) network, and the other on an HF (3593 kHz) net, for sending and receiving e-mail-formatted messages. The SEDAN and APRS modes were managed by Barry Isbelle, N2DB, and the Winlink stations were run by Jim Winfrey, KJ4SBG, and Ray Cook, WD4SEN, the Assistant EC for Clay county, Florida. EOC that was deployed to the exercise field. The State's mobile back-up EOC, packed with radios and computers, can perform all of the Emergency Support Functions (ESFs) when the hard EOC at Tallahassee is taken out in a major disaster. Ms. Barker is a communications and network analyst/expert. Another Amateur Radio Unit tent station position was reserved for Red Cross communications. John Reynolds, W4IJJ, Communications Officer for the Florida Red Cross (state level), monitored and received messages via the tent's 2-meter Call Channel on 147.585 MHz, and then relayed the messages via KGB-223 on the Red Cross frequency 47.42 MHz, which was also used to communicate with rolling Red Cross van/units out of Jacksonville and Gainesville. These van/units are used primarily for Mass Care and Feeding functions for the Red Cross. The content of all the exercise messages was not as important as the connectivity: The goal was to have almost instant and reliable, effective and efficient connections across an incredibly diverse universe of public safety entities - from towns, cities, counties, the state, and the feds (FEMA), for every conceivable function, including not only the usual, traditional ones, but some that do not readily come to mind when thinking of disaster management, such as mapping units (the Alachua County Mobile Mapping Unit); radio shops (City of Jacksonville Radio Shop); Civil Air Patrol (Florida Wings); Florida Department of Health - IT Security; Florida Fish and Wildlife Conservation; Seminole Tribe of Florida; and mortuary services - to name a few. The American Red Cross has made the decision to phase out and decommission its Emergency Communication Response Vehicles (ECRVs), due to changes in technology, as well as a new satellite system and other factors regarding the vehicle fleet. "Retrofitting the decade-old vehicles with new equipment is not a good use of donated funds, as the long-term strategy is to move to more portable systems," American Red Cross Disaster Services Technology Manager Keith Robertory, KG4UIR, told the ARRL. "This is consistent with the trends in the telecom and technology industries." The American Red Cross will be removing the Amateur Radios out of the ECRVs as part of the decommissioning process. These radios will either become part of the deployable inventory or provided to the chapter to build the local capacity. Equipment that can be used by the American Red Cross will not be phased out with the vehicle. According to Robertory, every communication capability of the ECRV already exists -- or will soon -- as a rapidly deployable kit that can be loaded on any vehicle that is owned or rented by the American Red Cross, providing more flexibility in shaping its response to match the disaster. "From a radio perspective, the American Red Cross has a variety of different kits for amateur, business and public safety bands covering HF, VHF and UHF with portable radios, mobile units and base stations," he explained. "Two-way radio remains a valuable tool, providing communications in the initial days or weeks of a disaster, until normal communications is restored. Each American Red Cross chapter should continue with -- and improve -- the relationship with their local Amateur Radio operators. In a disaster, Amateur Radio will be the fastest deployed radio network because operators already live in the impacted communities." Robertory called the ECRV operators "the key to the success of the ECRV program through the years. Their skills, dedication and flexibility have made the ECRV one of the most visible aspects of the American Red Cross Disaster Technology team. The ability to establish connectivity and communications remains vital to the American Red Cross, and their skills will continue to be needed as the American Red Cross implements new technology strategy and tactics. The commitment and flexibility of technologists -- including radio operators -- is what makes technology on a disaster successful. Building our future path based on the lessons we have learned is important to keep us all successful." "This should not be seen as a setback for those radio amateurs who are working with the American Red Cross," said ARRL Emergency Preparedness Manager Mike Corey, KI1U. "In disaster response, adaptability is critical and keeping up with new technology is essential. This all must be done with a mind toward an effective and efficient response. Amateurs have played an important role in assisting the American Red Cross with their mission and I know we will continue to do so in the future." Information about how to purchase these vehicles will be shared at a later date when the details are firm. SKYWARN across New England was active for a blizzard that pounded the region with very heavy snowfall, blizzard conditions, winds to hurricane force, and significant tree and power line damage and power outages over southeast Massachusetts and Rhode Island on Friday, February 9, extending into Saturday, February 10, 2013. WX1BOX, the Amateur Radio station at the National Weather Service in Taunton, Massachusetts, was active for 28 continuous hours of operations. "Our hopes to escape the 2012-2013 winter with nothing more than routine winter storms ended when this blizzard came to New England, said Rob Macedo, KD1CY, ARES® SKYWARN Coordinator for NWS Taunton and Eastern Massachusetts ARES Section Emergency Coordinator. "Eastern Massachusetts ARES was placed on stand-by on Friday, February 9, and that standby continues as of this writing as we have ARES operators remaining active on Cape Cod providing communications support for active shelters and for the Barnstable County (Cape Cod) Mutual Aid Coordination Center (MACC)," Macedo said. Emergency Management Agency, Red Cross, other Non-Governmental Organizations (NGOs) as well as the media. This provided critical situational awareness and disaster intelligence information to all of these entities. Snowfall totals of around 12-32" were recorded across Massachusetts, Rhode Island and Connecticut with lesser amounts on Nantucket Island. Boston Logan Airport recorded its fifth highest snowfall ever with this blizzard. Moderate to major coastal flooding was reported with the most significant coastal flood damage to roads and even shore structures recorded in Hull, Scituate, Sandwich, Gloucester and Salisbury, Massachusetts. Damaging to hurricane force wind gusts coupled with wet snow caused over 410,000 to be without power largely in southeast Massachusetts with over 170,000 without power in Rhode Island. "The Amateur Radio mission in our region has really evolved into providing information on damage, power outages, and meteorological surface observations in situations such as this blizzard -- it isn't just about 'when all else fails' anymore," Macedo said. The New England Reflector system on Echolink *NEW-ENG* node: 9123, IRLP 9123 was active and at one time had over 65 connections from stations within the affected area of the blizzard. The VoIP Hurricane Net system on *WX_TALK* node: 7203/IRLP9219 system was used as a listen-only system for those amateurs who wanted to listen in on some of the blizzard operations. Many local VHF and UHF repeaters were active with roll-call SKYWARN nets setup at 2 or 3 hour intervals. In Connecticut, the Hartford-Tolland County SKYWARN Net alone had 8 nets and 181 total check-ins across those 8 nets including nets run during the overnight period per a report from Hartford-Tolland County Connecticut SKYWARN Coordinator, Roger Jeanfaivre, K1PAI. Connecticut State SKYWARN Coordinator Steve Williams, K1SJW, commended and thanked all of Connecticut's SKYWARN spotters and coordinators for the fantastic job everyone did reporting weather information and storm damage during the blizzard. 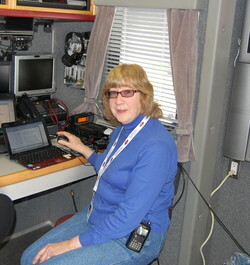 Connecticut ARES Section Emergency Coordinator Wayne Gronlund, N1CLV, and Connecticut ARRL Section Manager, Betsey Doane, K1EIC, echoed these comments. The Massachusetts Emergency Management Agency (MEMA) Region 1 WC1MAA Amateur Radio station, and Region 2 WC1MAB Amateur Radio station were staffed with RACES operators. Having operators in place to perform their functions at these served agencies helped to provide auxiliary communications. When power outages became so severe that the Pilgrim Nuclear Power Plant in Plymouth, Massachusetts had lost power, a roll-call was initiated on the state's VHF network. The Region 2 office did not hear the roll-call and was notified by the ARES sub-regional command center at the Acushnet EOC in Acushnet, Massachusetts, WA1EMA, that the roll call was taking place and notified Pilgrim that they would assist in making sure Region 2 contact was made. "Amateur Radio remains the ultimate back-up and has a significant place in providing situational awareness information for various served agencies," said Ed Caron, KA1RSY, District Emergency Coordinator for Southeast Massachusetts and Acushnet Emergency Management Communications Officer. John Miller, N1UMJ, was operating at WC1MAB to handle this traffic. Cape Cod ARES was active and put in over 72 hours of continuous operation during and after the blizzard. They provided SKYWARN reports of coastal flooding, snowfall reports, wet snow and wind damage from around their area. In Hyannis, George Correiro, W1GLC, recorded a wind gust to 84 MPH and in the Marstons Mills section of Barnstable, Massachusetts, Cape Cod ARES District Emergency Coordinator Frank O'Laughlin,WQ1O, measured a 75 MPH gust. Wind gusts to hurricane force also occurred on Nantucket Island. Cape Cod ARES staffed multiple shelters and EOCs within their region, as well as the Barnstable County Mutual Aid Coordination Center (MACC). The National Hurricane Conference will be held March 25-28 at the Hilton New Orleans Riverside in New Orleans, Louisiana. There will be several Amateur Radio activities going on during the week. The National Hurricane Conference (NHC) leadership continues to recognize the valuable contributions of Amateur Radio and again invited us to participate with two sessions. NHC Session #1: Monday, March 25, 2013 from 10:30 AM to 12:00 PM, at the National Hurricane Conference (NHC). This is the main Amateur Radio session. · To seek legislation instructing the FCC to extend the requirement for "reasonable accommodation" of Amateur Radio station antennas -- a requirement that now applies to state and local regulations -- to all forms of land use regulation. · To oppose legislation that would lead to the reallocation of amateur spectrum or to sharing arrangements that reduce the utility of existing allocations. · To oppose legislation that diminishes the rights of federal licensees in favor of unlicensed emitters or encourages the deployment of spectrum-polluting technologies. · To seek recognition of the unique resources, capabilities and expertise of the Amateur Radio Service in any legislation that addresses communications issues that are related to emergencies, disasters or homeland security. · To support the complementary legislative objectives of other radiocommunication services -- particularly the public safety and scientific services -- that require spectrum access and protection from interference for non-commercial purposes that benefit the public. · To oppose "distracted driving" legislation that does not clearly exempt two-way mobile radio transmitters or receivers used by FCC-licensed radio amateurs. · To support legislation authorizing FCC Commissioners to appoint an electrical engineer or computer scientist as an additional member of their staffs to ensure that Commissioners have adequate access to technical expertise when making decisions. These objectives affect all of us as ARES operators and leaders to varying degrees. As related measures come up on the Congressional docket this year, make sure to support them with your lawmakers. Related new laws can greatly facilitate our ability to provide professional-grade emergency and disaster response communications. 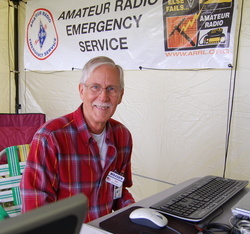 The ARRL Board of Directors voted to bestow the 2012 ARRL International Humanitarian Award upon John Bush, KH6DLK/V63JB, of Hilo, Hawaii and Federai, Ulithi, Yap, Federated States of Micronesia. Bush was recognized for his promotion of the development and welfare to the population of the Island of Federai in the Ulithi Atoll of the Federated States of Micronesia. In addition, he was acknowledged for his efforts in the development of an electronic infrastructure on the island, including electronic technologies and Amateur Radio. The ARRL has established the ARRL International Humanitarian Award to recognize those who have used Amateur Radio to provide emergency communications on an international level. The Board also voted to bestow the 2012 ARRL George Hart Distinguished Service Award upon ARRL Eastern Massachusetts Section Traffic Manager Marcia Forde, KW1U, of Concord, Massachusetts. Forde was recognized for her dedication to the National Traffic System (NTS). Since the early 1980s, she has held many positions within the NTS, including serving as Section Traffic Manager for the Eastern Massachusetts Section, Net Manager for the Eastern Area Net and as a Director of the Trans-Continental Corps. Forde, who has run various digital message systems -- from a packet node to a Winlink classic node -- is active in recruiting volunteers for all levels of the NTS. The Board created the George Hart Distinguished Service Award at its 2009 Second Meeting. It is presented to an ARRL member whose service to the ARRL's Field Organization is of the most exemplary nature. 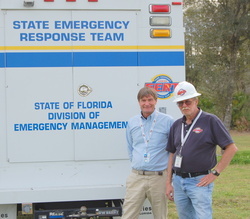 K1CE (l), with FDEM staffer Bob Little, KK4OAI, in front of the State Emergency Response Team van, Operation RADAR II, Camp Blanding, Florida. have access to the military base for these purposes. It was one of those rare moments in life where you just bubble over and beam with pride in seeing something that you have invested so much of your life in come to such a fruition and pinnacle of achievement. To see Amateur Radio have such a seat at the table at this level was simply amazing. I'd also like to note the contributions of other ARES, RACES and auxiliary communications groups that employ Amateur Radio that participated in this exercise either on site, or from their home facilities. These included groups from across the entire state, who participated from their home shacks or EOCs. In looking over the list of exercise participants, it was very heartening to see so many Amateur Radio emergency communications groups named. Bravo. A pitfall of being a writer/editor of a newsletter like this is that you end up as a pencil-pusher, relying on the reports of others who are actually performing the work in the field. For me, in the case of this exercise, it was good to "get out there."